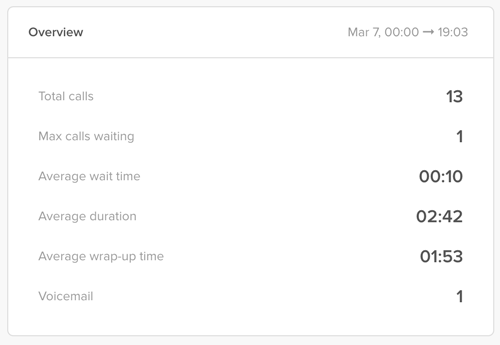 With the Zendesk Talk dashboard, you can view details about current queue activity, account-wide activity for the current day, and individual agent activity. Filter by numbers or agent groups to get further insight. This article covers the Talk Team dashboard. If you use Talk Professional or Enterprise, see Analyzing call activity with the Talk Professional dashboard. The Overview section displays additional metrics on your account's call activity from midnight to midnight for the current day. The time zone is based on your account settings. For details on Overview metrics, see Zendesk Talk dashboard metrics reference. 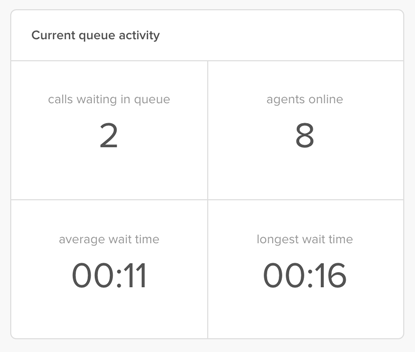 The Agent Activity section shows a summary of call activity and current availability status for each agent. For details on the metrics in this section, see Zendesk Talk dashboard metrics reference. Are there any thoughts on creating a pop out version of the dashboard? I have a wall monitor set up which displays our current call centre software dashboard, but we're switching to Zendesk Voice soon and I can't find a nice way to display Zendesk Voice. Even geckoboard doesn't have Zendesk Talk or Chat data available. Ideally we could display Ticket, Chat and Voice info on one dashboard. Hey Intis, I see that you're getting help with this from one of our Account Executives in a ticket. Let us know if there's anything else we can help with! Hi, was there a simple solution to the query about an all in one dashboard? There was not. One of our Account Execs reached out to Intis to understand the need better; but they didn't really find a solution. That being said, another Community member recently created a monitor dashboard display using the API; you might want to check out that solution and see if it might help you out. "Geckoboard lets you create beautifully simple real-time dashboards from your Zendesk data within minutes. Pick which metrics are important to you, and build the ultimate customer support dashboard to share with team members or management, or even to put up on the wall in your workspace. Geckoboard plays well with a number of other services too, so you can get full visibility on all aspects of your customer service setup in one place." Thanks for jumping in, Carl!